There is one piece of gear that goes with me on every flyfishing journey, whether it is a half day trip to local waters, or a week in Montana. I've owned a fishpond Cimarron wader bag for approximately 10 years (likely longer, but I can't recall for sure). The bag has a zippered and ventilated compartment in the bottom for storage of waders and boots, and the main compartment holds a ton of gear, to include raincoat, reel cases, extra fly boxes, spare tools, water filters, sweatshirts, and your fly vest. The main compartment has numerous pockets along the inner walls of the bag so that you can organize smaller items if needed. There is a sling strap, and hidden backpack straps if you wish to use it as a backpack to haul your gear into the back country (I've used it that way). There are exterior straps to secure a rod tube, and the bag is tough. When I fly to a fishing destination, it is a bag I stuff full of gear, and check with the airline. It has taken any abuse that the luggage handlers dish out, and my gear inside always arrives intact. After years of tough use, one of the interior metal supports broke. I sent it to fishpond for a repair, and they sent me a new bag at no cost. I was planning to pay for the repair, but I was impressed by the great customer service of this Colorado based company. I highly recommend this bag, you won't regret buying one. BDF uses a three tiered gear rating system for gear reviews. 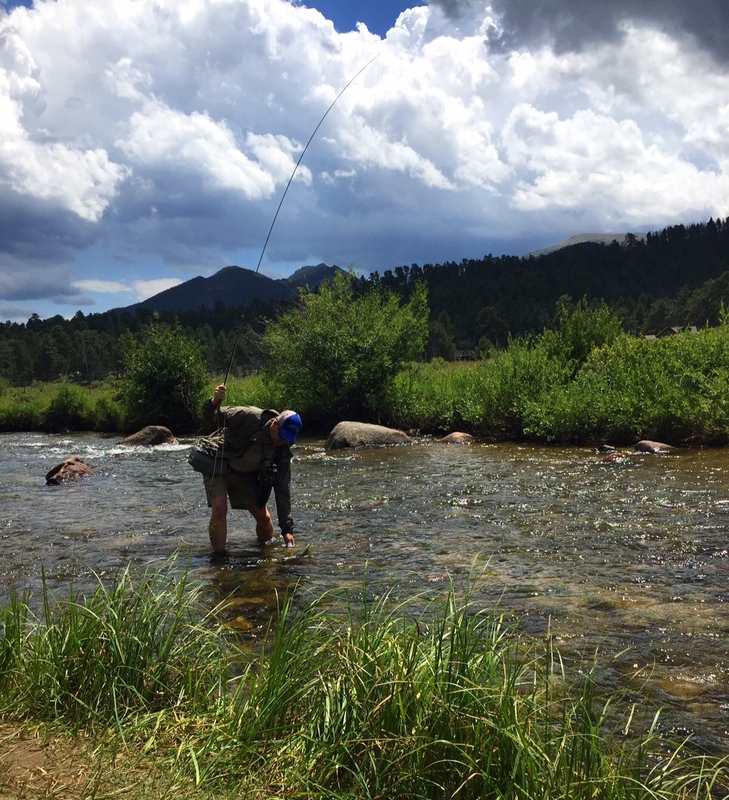 The fishpond Cimarron wader bag earns Dry Fly status. An upcoming fly fishing journey drove me to the fly tying bench this weekend. As usual, I put off tying until right before I need to restock my fly box. 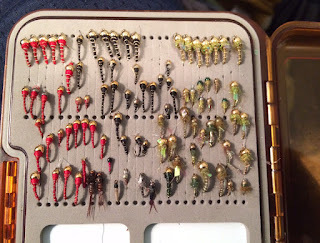 Over the years I've tried to organize the fly tying bench to look like the examples that you see in photos in the fly fishing magazines, orderly drawers of properly sorted hooks, beads, and materials. The problem is, I can't find anything that way, and I take comfort in the piles that I inevitable create during the frenzied tying sessions before a trip. My wife and I went to a favorite part of RMNP recently to take a break from the busy days of summer. She enjoyed reading a favorite book while I did some wet wading in the stream. The brown trout were leaping to the Parachute Adams I was fishing, and the soft bend of the "old school" Scott G made for a wonderful experience. Make sure you take time this summer to enjoy the river. PRODUCT REVIEW: Hydration On The Go!